With Broadway critics waxing rhapsodic over his potent physicality. Brando showed typical perversity in selecting a wheelchair-bound war hero for his celluloid debut. Ken Wilcheck is an all-American boy consumed with bitterness and a dread of the life of dependency that awaits him (the soldier on whom the role was based would subsequently commit suicide). Setting a precedent for all Method devotees. Brando got into character by spending three weeks in the paraplegic ward of a veterans hospital. Most memorable moment: Ken spitting anger and sexual frustration at devoted, upbeat fiancée Ellen. Coppola’s jungle folly was already notorious, so turning up on location overweight and under prepared may have been an attempt to get into the spirit of the production. With the more combative aspects of Colonel Kurtz’ ‘warrior poet’ character toned down. Brando was free to read T. S. Eliot and improvise with a recuperating Martin Sheen and a well-medicated Dennis Hopper. The results were indulgent, pretentious and mesmerizing: emerging from the darkness. Brando’s domed head is as striking an image as the napalmed tree line. Most memorable moment: Disgust vying with admiration during the ‘severed arms’ speech. Robert E. Lee Clayton is a regulator brought in to deal with a gang of rustlers a stock Western character in a standard horse opera scenario, yet Brando attacks the part from a variety of eccentric angles. Clayton’s accent wanders to Ireland and back, his flamboyant wardrobe includes women’s clothes, he is depicted to be more violent than the outlaws themselves, and there is the odd hint that he might be romantically involved with his horse. Already starring as Rio, Brando stepped behind the camera to replace Stanley Kubrick, and though it’s tempting to wonder what might have been, the film as it is has a lot going for it. Katy Jurado, Slim Pickens and Ben Johnson hold their own alongside director and fellow Method graduate Karl Malden (Dad Longworth), and complex psychological motives underpin the essentially simple revenge plot – a reworking of the Pat Garrett and Billy The Kid legend. Most memorable moment: Rio learning to shoot again after Dad has smashed his gun hand. That other icon of 1950s’ delinquency, James Dean, looks like something of a wuss compared to Johnny Strabler and the rest of the Black Rebel Motorcycle Club. The hepcat dialogue has dated and the film betrays its low budget at times, but Brando is extremely cool and the camera lusts after him almost as much as small-town good girl (and sheriff’s daughter!) Kathie Bleeker. “Hey, Johnny, what are you rebelling against?” “Whaddaya got?” is the immortal reply. The knives were out for this one: how would the Method torch bearer, fabled for relying on instinct and celebrating inarticulacy, cope with the constraints of iambic pentameter? Brando’s Mark Anthony is a triumph, matching the classically trained titan John Gielgud in terms of controlled technique, and having the courage to hint at raw emotion beneath a surface of dutiful nobility. Most memorable moment: “Friends. Romans, countrymen…” You’ve heard elements of this speech dozens of times, but Brando makes it seem as immediate and urgent as a newsflash. From the opening shot of Brando grimacing in anguish to the violent conclusion, the intensity is unremitting. With Corleone’s facial padding gone, the world’s most beautiful male visage made a glorious return, only for the sensuous mouth to spout obscenities that still shock today. Most memorable moment: The scene in which Paul sits with his wife’s corpse. The viewer feels like someone intruding on private grief as anger, loss remorse, guilt, resentment and, Ultimately, heartbreaking love come pouring out of him. After a decade of flops, Brando came to The Godfather unbankable, unreliable and – with the crucial exception of Francis Ford Coppola unwanted; he left with a revitalized career and a (famously declined) Best Actor Oscar. 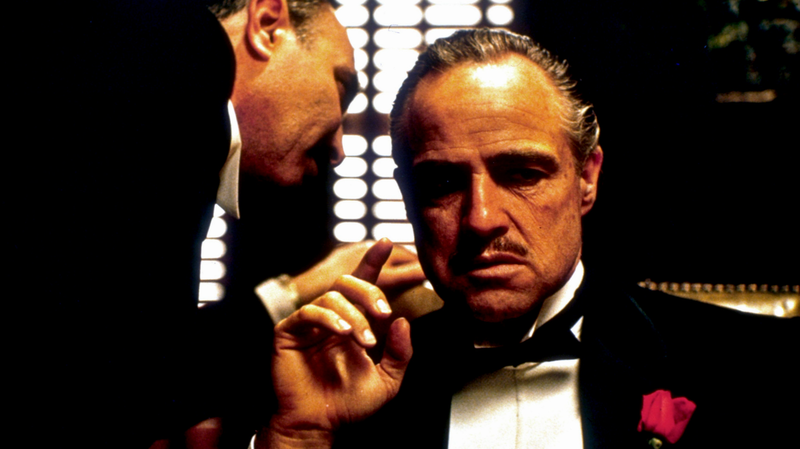 Don Corleone is ruthless, warm, funny, cunning, compassionate, lethal. Brando plays these characteristics to create a fully realised individual – the Vito who dances with his daughter is the same Vito who resolves disputes by decapitating thoroughbreds. Most memorable moment: Magical stuff with Al et al. But don’t forget the death scene in the garden. Most memorable moment: The encounters with Vivien Leigh’s Blanche still captivate, but its Stanley bellowing his beloved’s name “Hey. Stellaaaaaaaa” which has entered the collective consciousness. Stanley Kowalski may have been the breakthrough but it’s Terry Malloy who stands as Brando’s most influential characterization. Think of all the actors who’ve taken a messianic beating on film, think of every leading man who has played dumb and inarticulate, only to show a tender side with a kid/animal/astonishingly beautiful woman. Chances are they did it in one of your favourite movies, so you too owe a major debt to Marlon. Most memorable moment: “I coulda been a contender…” Malloy’s punchy persona slips for a few devastatingly insightful moments as he reveals his brother’s betrayal and his own feelings of worthlessness. Brando and former hot cat Elizabeth Taylor had triumphed in sweaty ‘50s melodramas, but what seemed intense then comes across as hysterical a decade later. Camp – and not in a good way. Insurance salesman Michael Winner will, if pressed, reminisce about his days directing the great Brando. The film in question is rubbish and notable only for the unlikely coupling of Marlon and Stephanie Beacham. Movie folklore has it that Val Kilmer’s antics lead to the firing/resignation of original director Richard Stanley (replaced by John Frankenheimer), so we’ll never know if he’d have had the wisdom/balls to question Brando’s Kabuki make-up. Exposes Brando’s unique ability to be totally genius and completely useless within moments of each other. A disastrous attempt to film and flog acting masterclasses. The whole thing descends into chaos when British advertising enfant terrible Tony Kaye bizarrely pitches up dressed as Osama Bin Laden, two months after 9/11. De Niro, Brando and Edward Norton… all cool. Plans, heists, double- crosses… all cool. The shoot- troubled, with Brando christening director Frank Oz “Miss Piggy”.